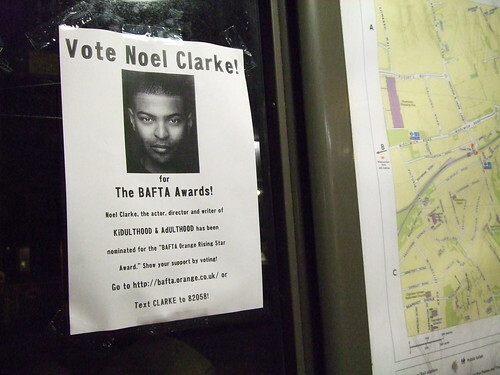 Has Bafta nominee Noel Clarke (the actor and director is up for the Rising Star award) got any south-east London pedigree at all? As far as I can tell he’s a west Londoner, but this poster Sellotaped up to the winos’ bus stop in Wellington Gardens, Charlton made me wonder. Either that, or he’s got a very dedicated fan around these parts. I wonder what the Tennants Super lads who park themselves at that bus stop would make of his work? One was taped inside a car on Lansdowne plus a few others taped onto lampposts all the way up that road and put on the cars. Also seen on a phone box at the Standard. Odd.